Helping couldn’t be sweeter than this. On the mail today from Mövenpick. Support Mövenpick’s #AKiloOfKindness campaign, leading to the UN International Day of Charity on 5 September, by donating at least one kilo of school supplies in our lobby from 21 August to 1 September 2016. 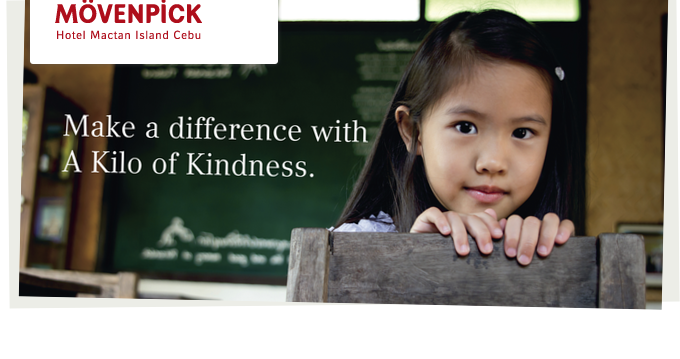 Mövenpick Hotel Hotel Mactan Island Cebu is pleased to support Cordova Alternative Resource for Education (CARE) Center, the organisation that will beneﬁt from your generosity. Encourage kindness by spreading the news: #AKiloOfKindness #InternationalCharityDay. Each person who makes a donation will receive an ice cream as a small gesture of appreciation.